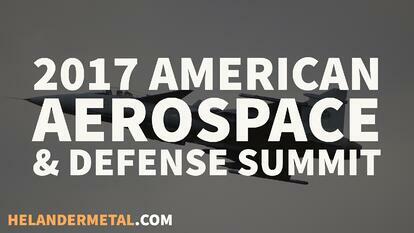 Helander Metal is thrilled to announce that we’ll be attending this year’s American Aerospace & Defense Summit, held December 5­-6 at the We-Ko-Pa Resort & Conference Center in Scottsdale/Fountain Hills, Ariz. This exciting yearly event brings together more than 150 industry leaders from top companies such as Boeing, General Dynamics, GE, and Lockheed Martin, as well as the U.S. Department of Defense. Centered on discussion of important industry issues — such as strategies for optimizing manufacturing and R&D in American aerospace and defense — the conference aims to connect industry leaders and facilitate the sharing of ideas, innovations, and trends. Various panels will also be held on a range of subjects, with useful tips on how to innovate among steep competition, enhance relationships with suppliers, reduce overall costs, and find valuable growth opportunities. The team at Helander Metal will be exhibiting at the conference, and we’re also proud to be sponsoring this event’s year. For more than 80 years, Helander Metal has been partnering with a diverse range of companies — from large, Fortune 500 companies to small, family-owned businesses — to provide top-quality custom metal forming and fabricating. We’re proud to offer a wide range of services, including metal spinning, metal stamping, CNC machining, aerospace welding, and hydroforming. And no matter how complex or unusual the project, Helander can provide the reliable, long-lasting custom solutions needed to help our clients easily meet the industry’s strict manufacturing, engineering, and precision standards. If your team will also be attending the 2017 American Aerospace & Defense Summit, be sure to stop by booth #16. Our experts will be on hand to discuss products and services and answer any questions you may have. In the meantime, place an order for a free, comprehensive company-overview guide to learn more about Helander’s capabilities and services.